I am really loving this coat from Tell Style. 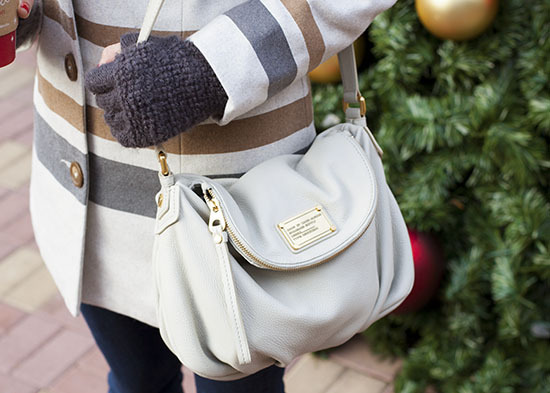 It's one of my favorite wardrobe additions this season. It keeps you cool while staying warm and cozy, if you know what I mean. The detachable faux fur collar and stripes amp up the classic style. As long as the air is frosty, I will be rocking this baby just like jingle bells. Have a HAPPY HAPPY day!! love your coat and lipstick color! lovely pictures dear! this is adorable and I loove the pictures! so cute! Such a beautiful coat and bag! SUCH a lovely coat! You look darling, love your hair up like that. i love your marc jacobs bag and your coat! Adorable coat; love the stripes and the fur! Gorgeous pictures. 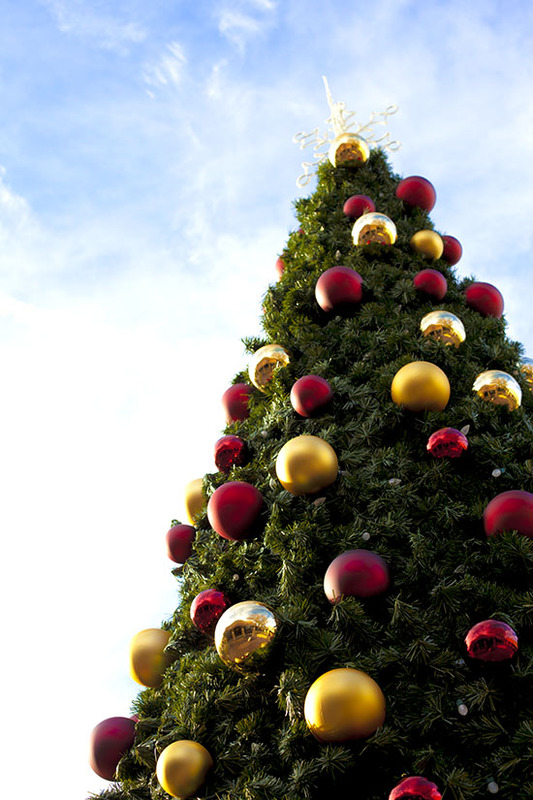 I'm totally loving your Christmasy backgrounds this week! Love these pictures. The red nails and lips are gorgeous! Man I've been eying that jacket for a bit and it looks even cuter on! Love your style girl, and love your blog!! You are so gorgeous and I love that coat!! I LOVE the coat, your hair, your lipstick...all around awesomesauce. 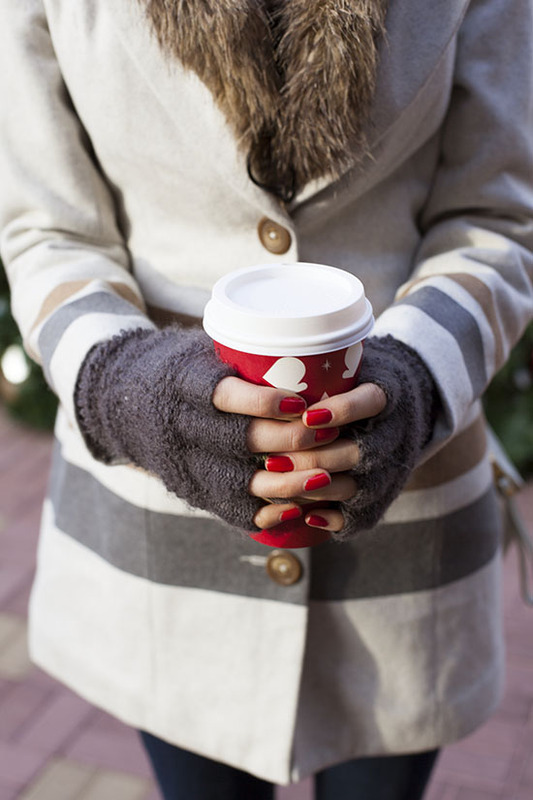 Your nails look so pretty, specially against the coffee cup! Love your shoes! Such cute photos and a perfect ensemble! 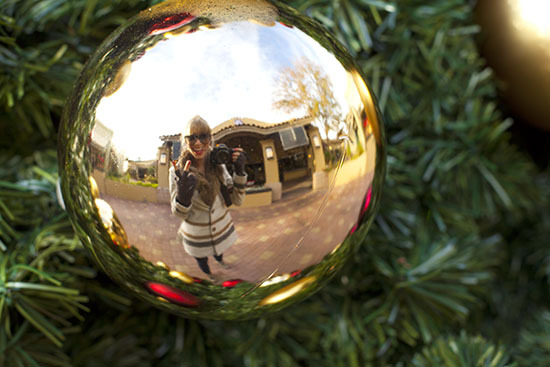 The pic in the Christmas bulb is adorbs. What a cozy jacket! Looks like a great day! That coat is fabulous!! Love that the collar is detachable too. You look beautiful as usual! nice pics and love your bag! such a cute look Katie! in love with the coat! Love the red nails and lips! That coat is gorgeous! I love the stripes and the fur detail. I just love your bangs. I think I might need some! Love the fingerless gloves and your booties Katie! omg this is the cutest!! i love the shot in the tree ball! the greatest. The coat is gorgeous. Love your nails and your lipstick. Such a cute look! 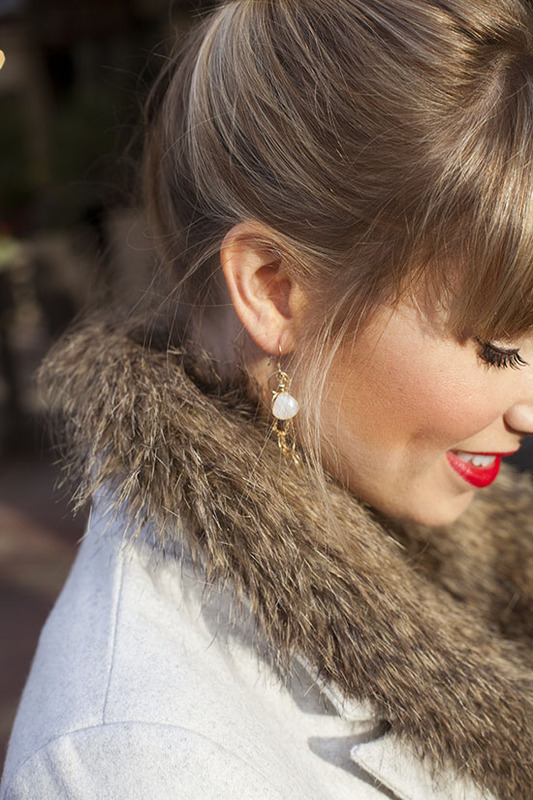 Loving your coat and how you added the red lip! such a cute outfit! love your festive nails! I am loving your cool weather outfits. They are so festive and too cute. Plus they look so warm. Lovely pictures.